I love okra, but really dislike the slimy-ness and the amount of oil needed to avoid the slimy feel. The recipe below gets around that by roasting the okra in the oven, so you only need a fraction of the oil. I make the tomato-onion-spice mix while the okra is in the oven, so it takes less than a half hour to make! 1. Spray the bottom of a large baking dish with olive oil. 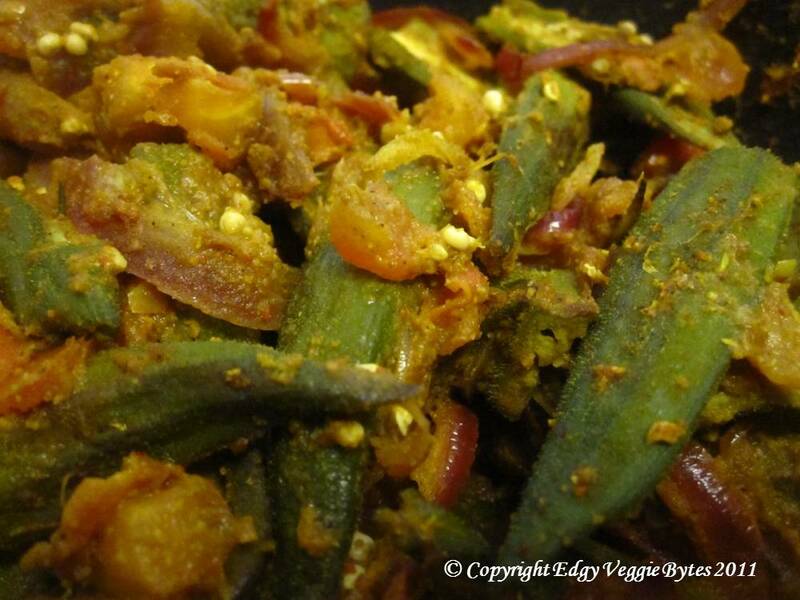 Arrange the okra in a single layer with the cut side facing up. Bake at 450 for 15 min. 2. In a skillet, heat 1 tsp oil on med-high heat. When hot, add the onions and asafoetida. Saute for 4 mins. 3. Mix in the cumin-coriander powder, paprika / cayenne, turmeric, dried mango powder, salt, and tomatoes. Cook for 3 mins, then remove from heat. 4. Mix in the okra. Serve hot! Nice information about Indian spices. Thanks for sharing this nice blog post. Cayenne is a spicy red pepper powder. I have also done it with paprika, which tastes good. Does it taste good if we make it into a paste? I’m not sure, I’ve never made it into a paste. I usually just add the spices as they are (too lazy to make multiple dishes… hehe) But if you try it, let me know how it turns out!